JUMC’s Angel Feet Ministry - Shoe Bank - Pray for this ministry and the children to served; purchase brand new sneakers for the shoe bank inventory; donate funds to the shoe bank: and help to serve this ministry. This ministry housed at JUMC is an opportunity for area churches and service organizations to get involved as well. Eligibility for the shoe bank will be based on need and those children of our community that receive medical assistance, CHIP, or have been referred by an agency. JUMC Angel Feet Ministry wishes to thank the volunteers who have dedicated their time to praying for the ministry, serving the children, buying shoes, gifting funds, and assisting in any way possible with the Ministry. A special thank you goes out to Bill Ellick for his tireless effort of scheduling volunteers and families each week. This ministry depends on God’s blessing and the service of its volunteers. 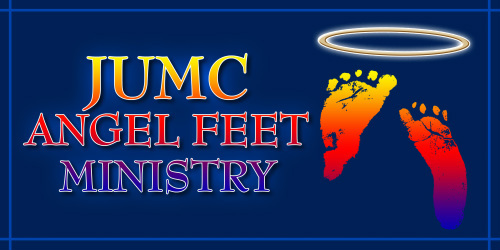 JUMC Angel Feet Ministry the past 6 years!